Is Big Money Being Used to Bully Judges? Political ads, bought in bulk, do a lot more harm than yield noise pollution. When corporations with a private agenda can selectively barrage our airwaves with attack ads, they can shape the national conversation, destroy reputations or curry favor with politicians. They can even influence our judiciary system. In fact, interest groups have increased their pricey investment on judicial elections. According to the Brennan Center for Justice, the year before the Citizens United decision, total non-candidate spending on state Supreme Court races was $11.4 million in 2009-2010. The year following the controversial ruling, in 2011-12, non-candidate spending spiked up to $24.1 million. Millions of dollars are going into ads full of negative allegations towards judges that special interest groups don't like. These broadcasted attacks -- or the threat of them -- are affecting judicial decisions. In states where Citizens United withdrew pre-existing bans on corporate spending in elections, Shepard and Kang found that there was a seven percent decrease in justices voting in favor of a criminal defendant. Why? The fear of "soft on crime" attacks ads insidiously influenced their decisions, specifically their customary instinct towards mercy. It's the "new normal" as Bert Brandenburg, the executive director of Justice at Stake, an organization that tracks money in judicial elections, describes it. "We are seeing money records broken all over the country. Right now, we are watching big money being spent in Michigan. We are seeing the same thing in Montana and Ohio. There is even money going into a district court race in Missouri," said Brandenburg to the New York Times. But having judges cowed into becoming more punitive is the tip of the iceberg. This study implies that the power of a large ad buy can help corporations to handpick judges who will better serve their interests and bottom line. Our country's concept of justice is getting warped through legalized intimidation. When global corporations, millionaires and billionaires enter the political battleground, their purchasing power gives them the muscle to wipe out the rest of our voices. 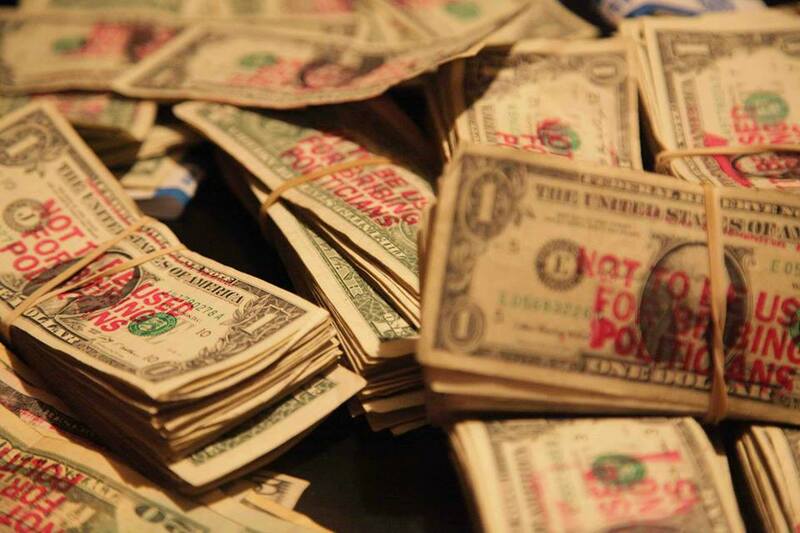 I began the non-profit, Stamp Stampede, to put an end the corrosive effects of money in politics. The rest of America needed arsenal to fight back and unleash our own media. Over 26,000 people are turning their moolah into their own miniature billboards -- stamping their dollar bills with "Not to be used for buying elections" and "Corporations are not people." It is a grassroots stampede that returns power to the people. And it's working. So far, 16 states and over 600 municipalities have already passed resolutions in support of an amendment to overturn Supreme Court rulings like Citizens United and McCutcheon. There is even growing bipartisan support in Congress advocating restore our constitution. This election year, thousands of political ads have staked claim on countless hours of our broadcast media. With 2014 being the costliest midterm election in U.S. history, this means substantially more funds are going towards campaign ads -- about $1 billion dollars. These political ads have indiscreet motives to erode our right to a representative democracy and even a legal system with impartial judges. Together we can repair the damage of big money influencing our elections and our courts, overturn Citizens United and restore our republic.